Valentine's Day comes once in a year. Therefore, leave no stone unturned to make it exceptional for your beloved. Choose from our delectable Valentine's Day cakes such as rose fondant cake, special 2 tier cake, gift box fondant cake, and floating hearts cake to offer your darling as a token of your sweet love. Valentine’s Day is a special time to celebrate your love with that special someone in life. This day not only brings you closer to your partner but also help understand the importance you hold in each other’s life. Gifts play a major role in expressing your innermost love to your partner and making the Valentine’s Day celebration special with them. When it comes to choosing V-Day gifts, fresh and yummy cakes top the chart. And as we know that Valentine’s Day comes once a year, you need something better than ordinary cakes. Our delectable range of premium cakes for Valentine’s Day is absolutely perfect to treat your partner and offer their taste buds a heavenly flavor. Ranging from kiss emoji cake to heart-shaped chocolate cake and floral cake to two-tier cream cake, our assortment of premium cakes is sure to delight their senses and ignite the spark in your relationship. Apart from premium cakes we also offer designer, cartoon, and photo Valentine’s Day cakes that will send across the message of love in the best manner. The feeling of being in love is divine that makes your life amazing and let you see beauty in everything. Valentine’s Day is the most awaited time of the year when lovers express their feelings for each other. And when pampered with the infinite love of your partner, it makes you feel on cloud nine. We at Ferns N Petals are known to offer the best Valentine’s Day premium cakes in town at affordable prices. These cakes are excellent to offer your partner as Valentine’s Day treat. 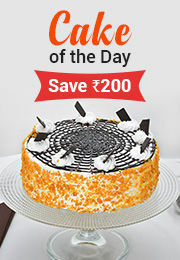 Available in a variety of flavors, such as chocolate, butterscotch, red velvet, and pineapple, the premium cakes can be ordered online and get delivered to the doorstep of your beloved via our same day and next day delivery service. Our assortment of fresh and lip-smacking premium cakes will satiate their taste buds in the best manner possible and add both sweetness and joy to your love life.